Life would be grand if we could sprinkle a few seeds in the ground, fertilize, add water…and a great sales person would sprout. This is truly a pipedream, but one often pursued by small business owners and sales management executives in their quest to find great sales talent. Rather than grow their own, they attempt to steal the crops from their competitors. Why not, their competitor is much better at growing a sales organization than they are. They will grab some magic from their competitor’s land and they too can enjoy great success. When did the competition begin building a better sales organization than your company? Before you harvest their crop, consider these five myths when hiring your competitor’s sales people. “Hiring from the competitor means the sales person will hit the ground running with no training.” Some of the attraction to the competitors’ sales people is sheer laziness. Hire a sales person from the competitor today…instant revenue tomorrow. No need to train them, they already know everything. Needless to say, this is flawed thinking. Sales people always need training and development regardless of who their former employer was. That said, every once in a while, lightning will strike and you will hire a rainmaker. More often than not, this approach is a recipe for a making a bad hire. A thought…What sales people do you really think are available from the competition? Rarely is it the top performers. It’s the bottom 20% that, truth be told, the company is glad to see leave. “Our industry is so complex that we must hire a sales person from within it.” How can this be true? No one ever came out of the womb mastering your industry…not even you. You were taught it and so was everyone else. If you truly feel that industry experience is the top requirement, be prepared for another major challenge…scalability. There are only so many people in your industry and very few that you will consider hiring. At some point, your talent pool will run dry. Sales people need to have a certain level of knowledge to effectively sell in an industry. Determine what they need to know to be effective and develop training tools to quickly get them up to speed. Identify resources in your company that can help them with their questions. Test their knowledge assimilation along the way to make sure they are getting it. “They’re going to bring a book of business with them.” Before you buy that argument, consider these three points. First, despite what they tell you, it is extremely difficult to move clients. The pain of change is not one that is easily resolved with clients. It is rare to find a sales person with that strong of an influence to overcome that issue. Second, the sales person doesn’t own those clients, their employer does. While non-competes don’t usually hold up in court, client list protection does. And, you can be at risk in the mess. Do you really need that headache? Third, don’t think for a minute that the sales person you hire today will one day retire with your firm. They will leave your employ some day. Imagine your sales person attempting to take your clients with them when they go. It doesn’t feel overly ethical, does it? And, it’s a flawed reason to hire a sales person. “We’re a little firm and we could really use a sales person that comes from one of our large competitors.” This statement is true if, and only if, your company and the large competitor are identical twins. A synergistic match between your company and the candidate is needed to put together a long-lasting sales marriage. There are a number of nuances that affect this synergy. The flaw with this statement is that it assumes a complete sales culture match. Every sales organization is different, even within the same industry. The large competitor may have a ton of sales support for prospecting and presentations, while in your company the entire burden is on the sales person. The sales person at the competitor may enjoy great name recognition in the marketplace while you do not. Thus, a different skill set is needed to get in the door with prospects. The list goes on and on. The key is develop a profile of your ideal sales candidate with the required and desired attributes and interview accordingly. Years ago, I had a sales person on my team who had sold for three of our competitors prior to joining our company. I participated in a ride-along sales call with her and the meeting was interesting to say the least. She could have had any of her former employer’s business cards in her hand, or ours for that matter, and everything she said was accurate. There was no passion. It was all vanilla information that failed to arouse any excitement in the prospect. Sales hiring is daunting for companies of all sizes. The key is to have a profile of your ideal sales candidate and interview the prospects against it. This will help you find the right sales talent for your team whether they worked for your competitor or not. 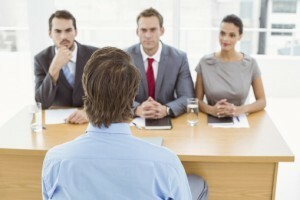 Need help interviewing sales candidates? Get my FREE White Paper – Top 100 B2B Sales Person Interview Questions. © 2015 by Lee B. Salz. Lee B. Salz is a leading sales management strategist specializing in helping companies build scalable, high-performance sales organizations through hiring the right salespeople, effectively onboarding them, and aligning their sales activities with business objectives through process, metrics and compensation. He is the Founder and CEO of Sales Architects, Business Expert Webinars and The Revenue Accelerator. Lee has authored several books including the award-winning book Soar Despite Your Dodo Sales Manager. He is a results-driven sales management consultant and a passionate, dynamic speaker. Lee can be reached at lsalz@SalesArchitects.net or +1 763-416-4321.